Gentle Scale Modelling: Bendy Buses? Now we have Bendy Tanks! In my enthusiasm to get on with the A-13 Cruiser there were a few things I didn't check out. It is a 'sort of' short run kit. Although we think of Bronco as a mainstream manufacturer, this kit exhibits many of the traits of a short run manufacturer. Whilst we have some moulded alignment pins, many parts just don't have them. I just love etched brass! (well no) but this kit has lots of it. Unfortunately, unlike some of the mainstream manufacturers, the etched isn't optional. Ever tried to fit a strap around a 1/35th scale exhaust pipe? No? - well I have! Every one complained that the rubber band tracks in the earlier A-13s didn't fit. So, now we have the smallest mouldings possible - 120 per side - to make the tracks and - guess what! - NO rubber band option. I even went looking for some Friul Modellissmo tracks. Biggest of all, the whole of the upper hull is warped!!!!! However, I have spent more time working on this kit than anything I have made in the last year. 2 1/2 hours, the other evening. 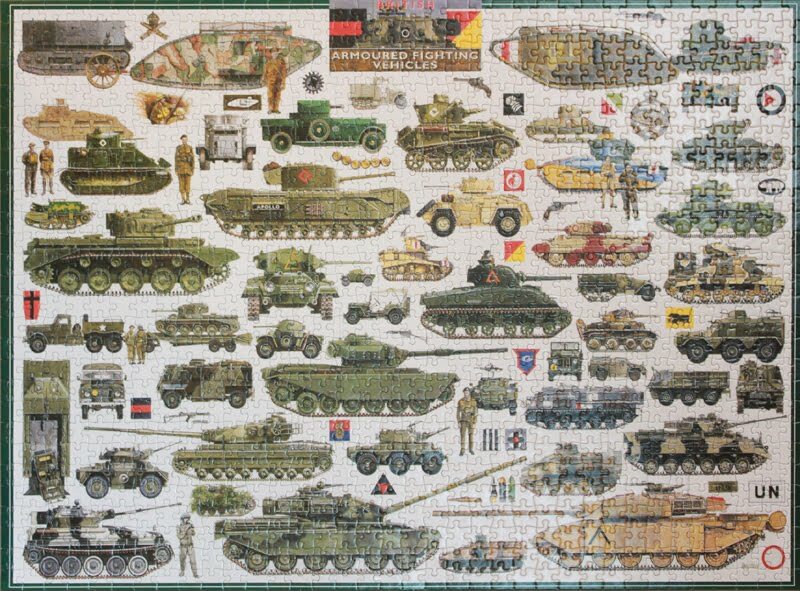 Lastly, to show you what I have really been spending my time doing, here is a Jigsaw puzzle lent to me by my good customer and even better friend, Paul Waters. 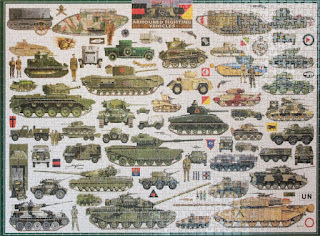 It's a 1,000 piece puzzle that illustrates the vast bulk of armour used by the British Army. This has inspired me to try and expand on my current little group. I have done a Humber Scout Car, A Scorpion from the UN Balkans and now the A-13 from the desert in 41. Loads more to do. If these work as I hope, I may lay low the ghost of Aircraft modelling - smile.